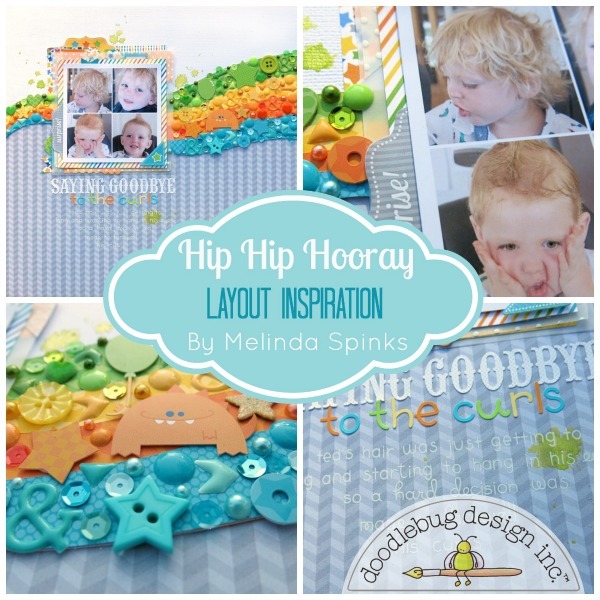 Happy Thursday... it's Melinda with you today and I'm going to show Hip Hip Hooray's versatility by sharing a layout I created with a non-birthday or celebratory theme! Sometimes it's easy to look at a collection and think 'I love it but I just don't scrap that particular theme'... however, if you flip the papers over you'll find an array of gorgeous patterns and prints that can be used for any style of layout... if you love it then you'll find a way! I must admit I find it hard to go past a chevron print so used the grey reverse side of the Shades of Chevron for my background paper. Then I decided to go a little wild with colour by adding more of the reverse papers in a wave panel across the page. The idea was to really make the panel 'pop' against the grey background plus to have a little fun! 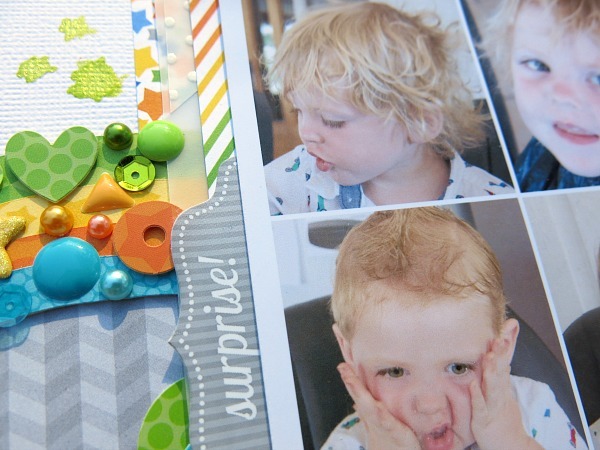 Now the actual theme of this layout isn't one I really wanted to celebrate because it broke my heart to make the decision to finally cut my little man's hair. However, he wasn't worried about it at all and was actually quite cute and cheeky during the trim so I decided to use that as my inspiration which led me to the collage of Sprinkles, Sequins, Buttons, Stickers etc! 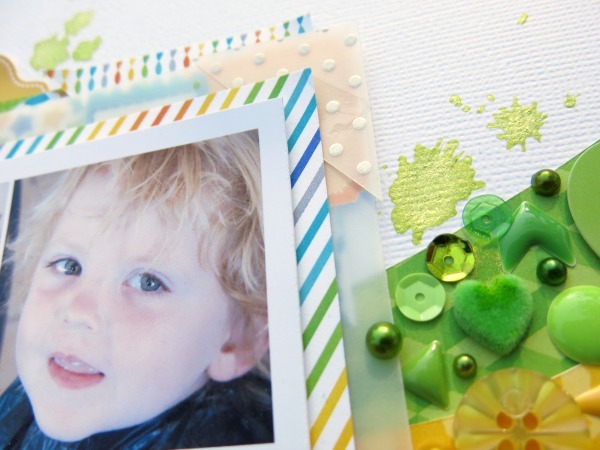 The photo collage was mounted on a mat of patterned paper layers to which I added small touches of the new Sprinkles vellum to soften the overall look. Would love for my hand writing to be this neat but sadly I can't lay claim to the journaling as I used the mini rub-ons in Lily White. We are giving away some amazing boxes filled with an assortment of our new Hip Hip Hooray Collection SIX lucky winners. We are going to be looking throughout the next couple of weeks as we feature this new collection. You can continue to support us each day and complete any or all of the following. The more you enter the more chances you have to win!! You will have until Saturday, April 19th at 12:00 noon MST to enter. We'll post the winner on Sunday, 4/20. Good luck!! THIS IS PURE GENIUS!!!! I LOVE LOVE LOVE it!!! Awesome job! OMG I love the rainbow of embelishmens! it's adorable. candy dots, sequins, cute buttons, pearls! Oh may! I pinned couple more pictures of the layout details because is great inspiration to use my embelishments! I share this post ans a picture of this cute layout on Facebook! I love all the ideas for boys this week! I pinned this cute layout! Pinned to 'Bow Tie Mom'. 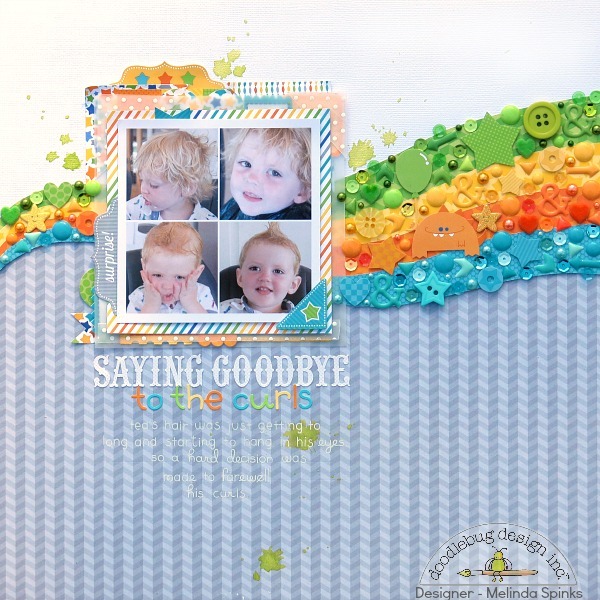 Super cute layout, love the rainbow wave of embellishments in the layout. 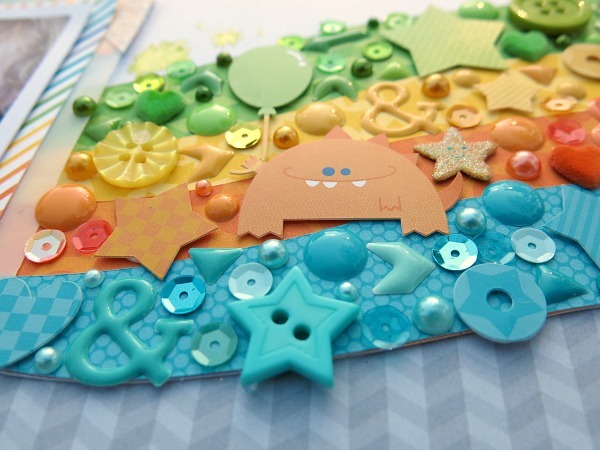 I love the page with the waves of bright color layered with all the doodads! I do want to mention though that the word "too" was spelled as "to". I'm surprised nobody noticed it before! PRECIOUS moment and ABSOLUTELY GORGEOUS layout Melinda!!! 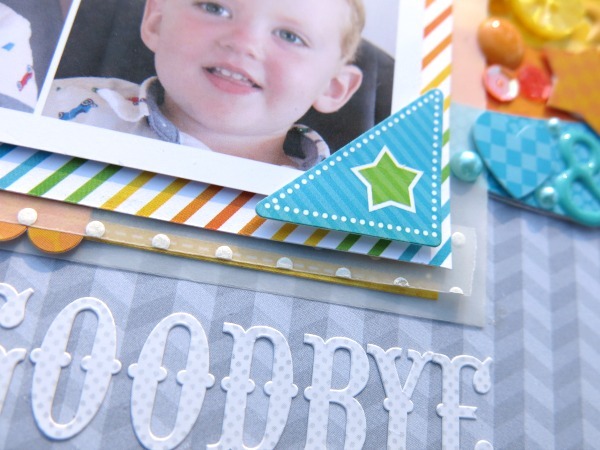 LOVE your Sprinkles, sequins and stickers - WOW - LOVE your journaling too, so CLEVER using rub-ons ... I really need to give this a try!!! 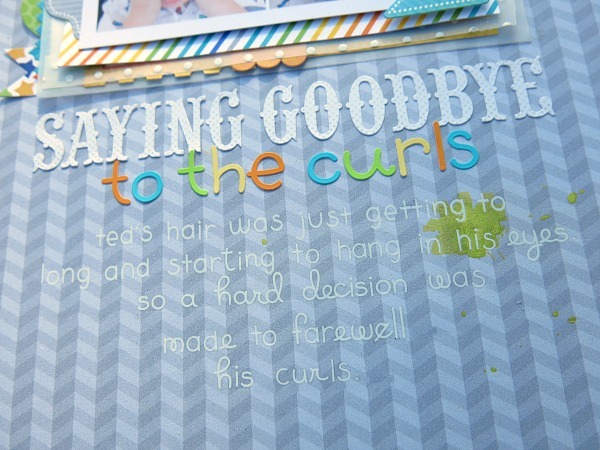 I Pinned the close-up of Melinda's precious journaling, LOVE the rub-ons!!! I love how you did the "rainbow". I follow on Instagram. I pinned this layout. I love it!! The buttons and embellies are awesome.